Muscle Milk is a protein-enhanced formula that promotes increased strength, lean muscle growth, and fast recovery from exercise. Designed after one of nature's most balanced foods: human mother's milk, Muscle Milk takes the guesswork out high performance nutrition by delivering a precise blend of ultra-premium proteins, complex carbohydrates, functional fats, vitamins & minerals. No matter what your goals may be - building lean body mass, toning your physique, or weight control, Muscle Milk delivers on both results and taste! EVOPRO™ - Nature's Perfect Protein: EVOPRO in Muscle Milk contains a complete and precise mix of highly bioavailable proteins for sustained energy including, Calcium & Sodium Caseinate, Milk Protein Isolate, Whey Protein Isolate, Whey Protein Concentrate, Whey Peptides, Lactoferrin, L-Glutamine, and Taurine. LEANLIPIDS™ Burn Fat! Don't Store It! : Predigested, trans-fat free Medium Chain-Triglycerides (MCT's) are more likely metabolized for muscle energy and heat than stored as fat. Long-chain polyunsaturated and monounsaturated fatty acids from Sunflower/Safflower and Canola Oils are also less likely to be stored as fat. These lipids are additionally functional, since they enhance mineral retention. Complex Carbohydrates: Zero-lactose, starch-based complex carbs found in Muscle Milk, supply energy to the body in the form of glucose. Glucose is the only energy source for red blood cells and the preferred energy source for exercising muscles that are operating anaerobically. Muscle Milk also supplies carbohydrates in the form of fiber, acknowledging that fiber is an important part of a healthy diet. 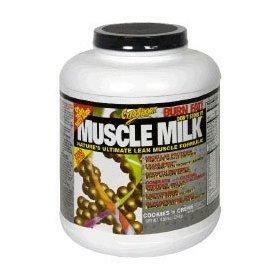 Buy MUSCLE MILK - HIGH PROTEIN SHAKE MIX Now!